WASHINGTON — After more than three months in office without passing any major legislation, President Donald Trump faces a week with a deadline to avert a government shutdown and the possibility of progress on health care. Trump has spent his first 100 days coming to terms with the slow grind of government even in a Republican-dominated capital, and watching some of his promises —from repealing the nation’s health care law to temporarily banning people from some Muslim nations — fizzle. Last week lawmakers sent the president a stopgap spending bill to keep the government open through Friday. Lawmakers will continue negotiating this week on a $1 trillion package financing the government through Sept. 30, the end of the 2017 fiscal year. Despite a renewed White House effort push, the House did not vote last week on a revised bill to repeal and replace the Affordable Health Care Act. After the original effort failed to win enough support from conservatives and moderates, Republicans recast the bill. The latest version would let states escape a requirement under Obama’s 2010 law that insurers charge healthy and seriously ill customers the same rates. The overall legislation would cut the Medicaid program for the poor, eliminate fines for people who don’t buy insurance and provide generally skimpier subsidies. Critics have said the approach could reduce protections for people with pre-existing conditions. But during an interview with “Face the Nation” on CBS aired Sunday, Trump said the measure has a “clause that guarantees” that people with pre-existing conditions will be covered. Trump said during the interview that if he’s unable to renegotiate a long-standing free trade agreement with Mexico and Canada, then he’ll terminate the pact. Also this week, the president will welcome Palestinian President Mahmoud Abbas to the White House. And he’ll head to New York City on Thursday where he’ll visit the USS Intrepid to mark the 75th anniversary of a World War II naval battle. On Sunday morning, Trump headed to Trump National Golf Club in Virginia. The White House did not immediately clarify whether he was holding meetings or golfing. 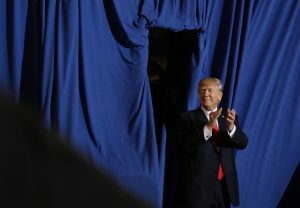 Trump marked his 100th day in office Saturday with a rally in Harrisburg, where he continued to pledge to cut taxes and get tough on trade deals. Trump’s rally Saturday night in Harrisburg offered a familiar recapitulation of what he and aides have argued for days are administration successes, including the successful confirmation of Neil Gorsuch to the Supreme Court, his Cabinet choices and the approval of construction of the Keystone XL pipeline.